Spring quarter’s been a doozy. I’m teaching more credits than normal and for the first time ever I’ve got an evening class from 4:00-6:00 pm three nights a week. Also, the high season for my husband’s business just kicked into gear about three weeks ago…the same time my quarter started. Taken together all of these changes have really put a dent in our normal dinnertime routine. Typically, I have no trouble spending an hour or more in the evening trying out a new recipe with multiple sub recipes or waiting for pizza dough to rise while I whip up a fresh salad and homemade dressing. But these days I’m looking for shortcuts anywhere I can find them. We’re talking chili-mac with canned (vegetarian) chili and boxed (Annie’s) mac and cheese, bean and cheese quesadillas with grapes as a side dish, or super-fast (fake) chicken Caesar salads. 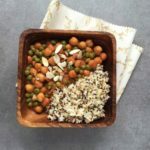 But there’s another recipe I’ve been relying on that feels more like I spent some quality time in the kitchen, but in reality it comes together in 15 minutes: Warm Red Garbanzos. When you only have 15 minutes for dinner, but want something warm and hearty, this recipe delivers. In large skillet over medium heat stir or whisk together first 5 ingredients. Add garbanzo beans and peas. Increase heat slightly to bring mixture to a boil. Reduce heat and simmer for 5 minutes. 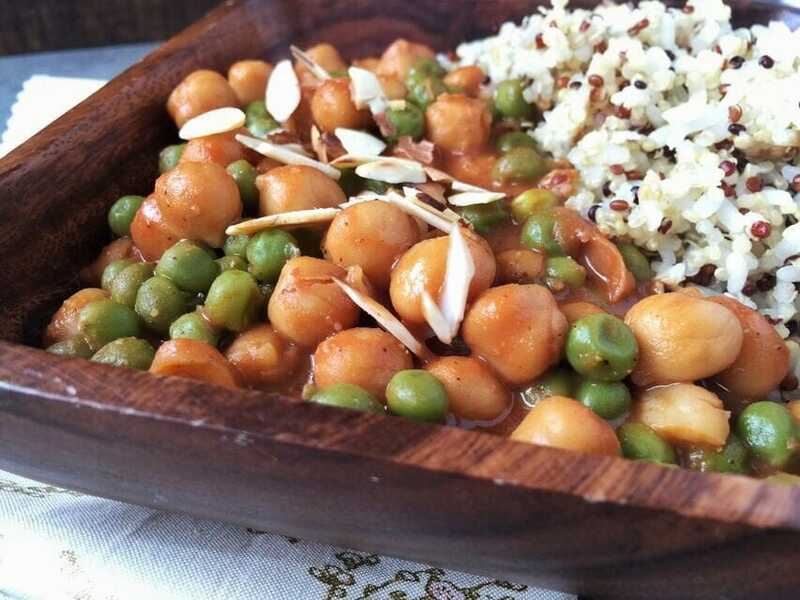 Serve with rice or quinoa and top with sliced toasted almonds. I used leftover peanut sauce, which was modified slighty from my friend Lori's Spicy Peanut Sauce Recipe. But, I think any peanut sauce would do: your favorite homemade sauce, a bottled sauce, or leftovers from the Thai restaurant. 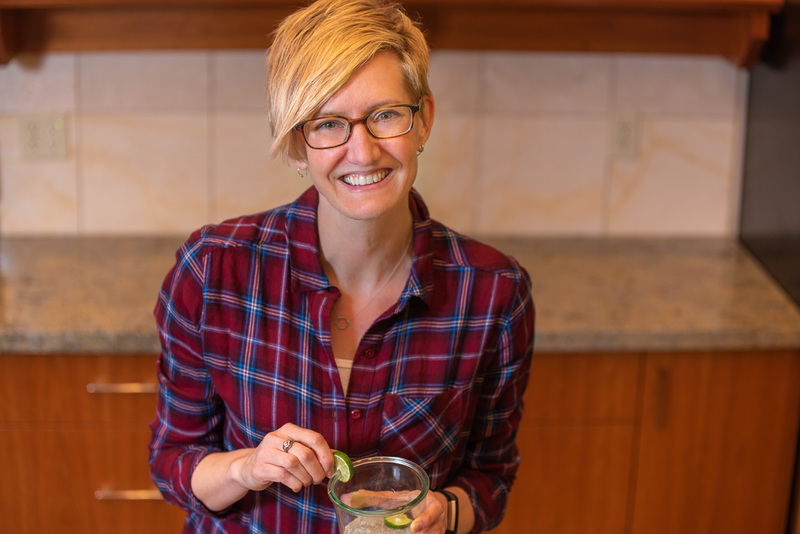 And since you'll be following the link anyway, Lori's recipe for Chickpea Bowls with Ginger Cucumbers and Spicy Peanut Sauce is one of our favorite go-to dinners. You should definitely put it on your menu soon. We served the garbanzos with a mix of half rainbow quinoa and half short grain white rice (sushi rice) that we whipped up in the rice cooker. This combo cooks perfectly on the white rice setting and fluffs beautifully. 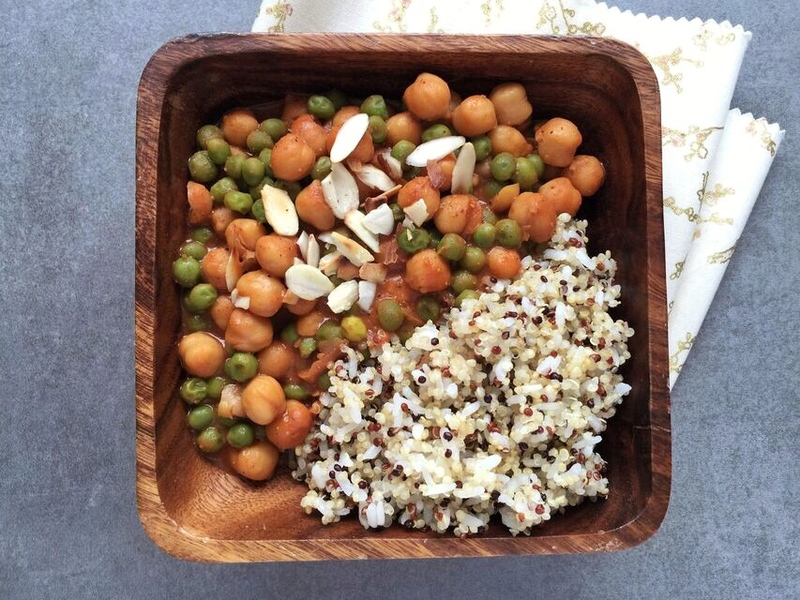 The addition of quinoa boosts the protein count and gets you a serving of whole grain to boot. The garbanzos come together in just 15 minutes. The rice takes about 30, so I’d start it first, but it’s all hands off time once you fill the pot and turn it on. (Or if you’re organized enough to batch cook on the weekends, you could have a cooked grain ready to go.) To round out the plate, some roasted cauliflower would be lovely if I had the time. But I don’t have the time, remember? This meal calls for a more convenient veggie. Bring on the canned green beans, baby. A few thoughts on ingredient selection…you could certainly use full fat coconut milk and regular tamari or soy sauce, especially if that’s what you have on hand in the pantry, but the nutrition facts will be vastly different. I wanted a dish that was quick and flavorful, without going over the top with fat and sodium. And I’m sure another frozen veggie could easily be substituted for the peas, like carrots or spinach. The sauce is pretty versatile, so feel free to mix and match other combinations of beans and vegetables. I hope your April schedule is just the right amount of full for your liking, with work or family or other commitments. But if you find yourself in need of a lightning-fast meal on a particularly busy evening, consider a bowl of these tangy, tomatoey, warmly-spiced little balls of goodness. Help me out. What’s your go-to dinner when you’re in a hurry? I need some more ideas to get me through to June! April was nuts, so I just got around to making this. I’m kicking myself a little bit for waiting. I love garbanzos to begin with and this combination was fantastic. I even have left-overs for lunch tomorrow. How did you arrange the rice/quinoa/water ratios in the rice cooker, though. I tried and it was….crunchy. I’m so glad you liked it! I really appreciate the feedback. My rice cooker comes with a little cup for measuring the rice. (It’s not a full cup, more like 3/4 cup.) The instructions say to do 2 “cups” of rice and then fill to the “2” marker on the inside of the cooker with water. So I used 1″cup” white rice and 1 “cup” quinoa instead. Hope that makes sense!